However, among the four countries that may have maritime territorial disputes with China, Brunei and Malaysia have maintained good friendship with China. Vietnam has eased tension with China. Even before easing of tension, China was not bellicose. It was Vietnam that sent coast guard ships and fishing boats to force China to remove an oil rig in disputed waters. China responded with coast guard ships and fishing boats to prevent Vietnamese vessels from coming near the oil rig without fighting one bullet. There were anti-Chinese riots in Vietnam that caused death of some Chinese people in Vietnam, but Chine did not respond with similar riots or even demonstration. Can China be regarded as bellicose in dealing with the disputes? When the US announced its return to Asia obviously aimed at containing China. Believing that the US will help it in its maritime territorial disputes with China, the Philippines sent its navy to round up Chinese fishing boats at Scarborough Shoal, China responded by blocking Philippine vessels’ way to the Shoal with its coast guard ships supported by its navy, but without firing even a shop. Shall the Philippines or China be regarded as bellicose in the much reported Scarborough Standoff? In fact, Reuters only quoted the words of Le Luong Minh, a Vietnamese diplomat who now serves as ASEAN general secretary, and Philippines President Benigno Aquino in its report on China being bellicose. That is natural. If China were really bellicose, it would have responded by invading Vietnam and attacking Philippine garrisons on the islands claimed by China. That is why the Philippines and Vietnam have been seeking US assistance in dealing with China. However, China responded to US pivot to Asia by allying with Russia and has thus encouraged Russia to confront the US over Ukraine issue. As a result, US attempt to contain China by its pivot to Asia was entirely a failure. Seeing that it can no longer rely on the US in contending with China, Japan has been making great efforts to mend ties with China. The Abe-Xi summit on the sideline of APEC summit signals the beginning of ease of tension between Japan and China. Vietnam suddenly sent a high official to restore its friendship with China after its delegation to the US failed to get the assistance it wanted from the US. The Philippines is now isolated. However, during APEC summit, Chinese President Xi Jinping took the initiative to talk with Aquino and express his desire for restoration of the two countries’ friendly relations before Scarborough standoff. However, as China’s military strength grows, Vietnam and Philippines fear of Chinese retaliation remains. Other ASEAN countries also feel threatened. That was why ASEAN said in its Chairman’s Statement, “We remain concerned over the situation in the South China Sea,” though it refrained from mentioning China. A friendship treaty will certainly ease ASEAN members fear of China’s rise why funding ASEAN development will certainly benefit China. As for South China Sea disputes, China has roughly resolved its dispute with Vietnam through bilateral talks. The vast sea area of more than 3 million square meters will provide China with lots of valuable resources. China certainly will not waive its claim to that sea area. China’s approach is quite different from other countries’ traditional one. It aims exploiting the resources instead of occupation of land. The US tried hard and incurred lots of casualties and financial burdens in its attempt to occupy Vietnam, Iraq and Afghanistan but failed. After its retreat, enlightened Chinese leaders have begun to exploit the resources in Vietnam and Iraq jointly with local government. It is also trying to enter Afghanistan. In that approach, China has to share the benefit from the resources. It can only do so through bilateral talks with other claimants one by one. Now, there is only one claimant who does not want that. As a result, instead of advocating multilateral talks when Hilary Clinton was US secretary of state, the US no longer persist in resolving the disputes that way. Bilateral talks to resolve disputes are rule based norms. The US has retreated from its former position on multilateral talks. 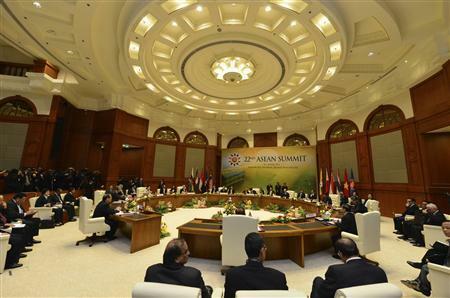 A general view of the retreat during the ASEAN Summit at the Prime Minister’s Office in Bandar Seri Begawan April 25, 2013. 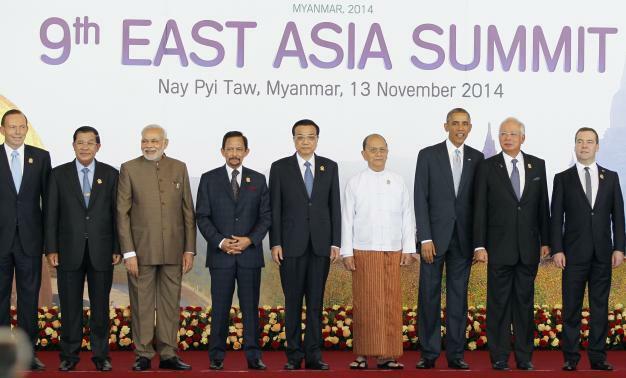 Leaders of the Association of Southeast Asian Nations (ASEAN) gathered in. Southeast Asian nations stepped up efforts on Thursday to engage China in talks to resolve maritime tensions, agreeing to meet to try to reach common ground on disputed areas of the South China Sea ahead of planned discussions in Beijing later this year. Efforts by ASEAN to craft a code of conduct to manage South China Sea tensions all but collapsed last year at a summit chaired by Cambodia, a close economic ally of China, when the group failed to issue a closing statement for the first time. Cambodia was accused of trying to keep the issue off the agenda despite a surge in tension over disputed areas and growing concern about China’s assertive stance in enforcing its claims over a vast, potentially energy-rich sea area. Thursday’s initiative came as the 10-member Association of Southeast Asian Nations (ASEAN) tried to patch up differences that shook the group last year, but struggled to make progress on long-held plans to agree on a dispute-management mechanism. Thailand, which has the role of ASEAN coordinator with China, called for the talks ahead of an ASEAN-China meeting expected in August to commemorate 10 years since they formed a “strategic partnership”. ASEAN Secretary-General Le Luong Minh told reporters that ASEAN would approach China with a common stance. “When we come to our partners to discuss important issues, we come as a group and we come with one common position,” he said, adding that the next move would be to get China to participate in the negotiations. China claims almost the entire South China Sea as its territory, setting it directly against U.S. allies Vietnam and the Philippines, while Brunei, Taiwan and Malaysia also claim parts. China insists on resolving sovereignty disputes on a bilateral basis. It has flexed its growing “blue water” naval muscle by occupying some areas claimed by Vietnam and the Philippines, leading to a rise in tension. Without mentioning Cambodia, Philippine President Benigno Aquino drew a strong contrast with last year’s discussions. He described as “beautiful” the fact that Brunei had brought up the South China Sea issue as the first subject. “We should really be thankful that the whole of ASEAN is willing to discuss this instead of putting it on the back burner,” Aquino told reporters. The tiny oil kingdom of Brunei, in marked contrast to Cambodia, it is keeping the maritime issue high on the agenda. But prospects for a legally binding code of conduct appear dim. The summit-concluding communiqué on Thursday made no new announcement, but said ASEAN ministers had been tasked to “work actively with China” for a conclusion of the proposed agreement. A U.S. move to rebalance its military forces to focus more on Asia has threatened to worsen tension, reinforcing China’s fears of encirclement. China has had a permanent naval presence for a year at the Scarborough Shoal, a rich fishing ground 124 nautical miles off the Philippines northwestern coast. Last month, it sent four warships to land troops on its southernmost claim – the James Shoal, 80 km (50 miles) off the Malaysian coast and close to Brunei. Tensions are likely to rise again in coming months, as monsoon weather eases and China imposes a unilateral annual fishing ban that has irritated Vietnam and the Philippines. Frustrated with the slow pace of regional diplomacy, the Philippines in January angered China by asking a United Nations tribunal to order a halt to Beijing’s activities, such as those at Scarborough Shoal, that it said violated its sovereignty. The Philippines appeared to win backing for that approach in Brunei, despite concern that it could be used by China as a reason to further delay talks on a code of conduct.